Aquarium fishes, along with virtually everything else that appeals to humans, go in and out of fashion. Many things affect this; what is on the cover of a magazine, what is appearing at your local retailer, even what other people are keeping or talking about. Some fish stay in fashion - discus appear a good example. Others fall from grace - I can remember a time when Malawi cichlids were much bigger than they are now in 2003 (well, in the UK at least). This month's catfish has the dubious honour of never having been in fashion, but like a trusty little black dress or white cotton shirt, oft appears in most wardrobes (read fishtanks). At this moment in time it is an infrequent import despite being very hardy, peaceful and abundant in its natural habitat. 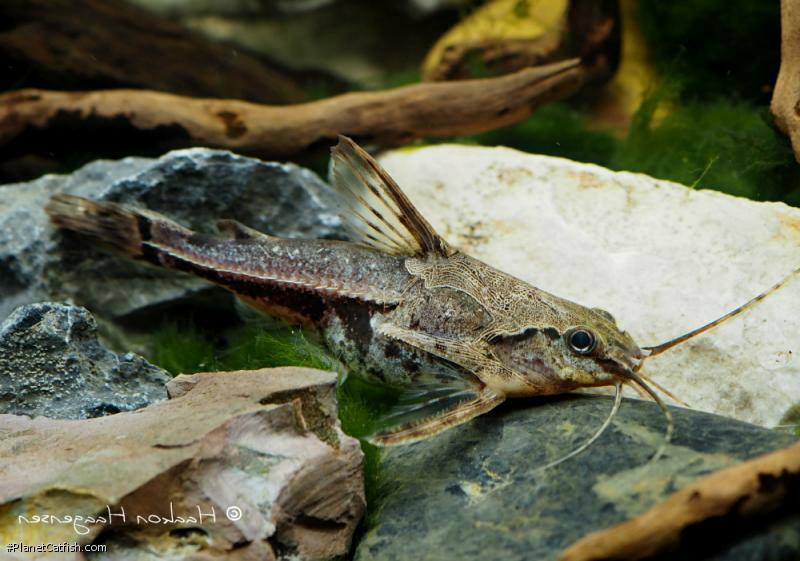 Despite all that, most dedicated catfish keepers will tell you they have kept this species at one time or another. Hiding in the most inaccessible part of the aquarium is typical behaviour for all the so-called raphael catfish and this one is no exception. If there isn't a great deal of spare food floating around the aquarium then these fish will become active at feeding time. It is at night that they come alive and start searching for food in the darkness. Care must be taken when handling these fish. Their dorsal and pectoral fin spines are very sharp and can cause injury by puncture. For the same reason transporting these fish is best attempted using a bucket or jar rather than the traditional plastic bag. Even double bagging these fish is no guarantee of leak-free transport. In fact a jar is the best way to capture this fish - nets are not recommended as the fish will get hopelessly entangled in them. Although they are easy to remove by hand, it is a hard-learned skill and not one for the novice to try out. On handling - I don't recommend you try this unless you feel you want to. You can get very nasty wounds from mistakes made with these fish. The fish react to you. If you grab them by any part of the body other than the head they will attempt to slice your fingers by bending around and trapping your finger between their serrated lateral scutes and one pectoral fin ray. This can be very painful indeed. It is however an interesting reflex to observe, upon first hand observation it is easy to see how this behaviour would be useful to the defensive doradid in the wild. Don't try and clench your fish around the catfish. Move your hand around slowly and try simply lifting the fish up without closing your grip - as you would lift, perhaps, a moth. If you do need a firm grip then place your thumb under the fishes head and your index finger just in front of the dorsal spine on top of the fishes head. Needless to say your hands should be wet during any contact with any fish. Care should be taken to avoid touching the fishes eyes at all times. During this sort of handling the fish will often make grunting, growling or squeaking sounds - they are most audible when the fish is removed from the water. This can be quite alarming at first but it is another natural anti-predator defence mechanism this fish has developed. Surprisingly, little is known as to the captive reproduction of this hardy fish. Reports exist detailing the construction of a bubble nest in vegetation and this fish does appear to favour quiet. muddy backwaters. Any breeding attempt should probably be made with a good number of these fish in a tank decked out with plenty of vegetation and a gentle water flow. The water shouldn't be deeper than 12" or thereabouts, with a soft substrate that will allow this fish to burrow - which it likes to do when threatened. As these fish are always imported from the wild it can be rewarding to carefuly examine all individuals imported in any given batch. There are several other very similar fish present that can sometimes be picked up alongside this well-respected catfish stalwart. Etymology Amblydoras: From the Greek amblys, meaning blunt and doras, meaning skin (also a word commonly used in forming generic names for doradids); in reference to the non-serrated dorsal spine. Size 111mm or 4.4" SL. Find near, nearer or same sized spp. Identification Reasonably easy to ID although young fish can look quite variable. Some degree of sexual dichromatism exists and the males bear a resemblance to the larger Anadoras grypus. Very often sold under the incorrect name of Amblydoras hancockii. Sexing Some keepers report that the underside of female is creamy white, the male is freckled as shown below. Males are more slender than the wider (when viewed from above or below) females. Distribution Upper Amazon River basin, Peru. Other Parameters This species is not fussy regarding water parameters. Feeding A nocturnal scavenger. Younger fish tend to be a little more active during the day, but the best way to ensure this fish is properly fed is to introduce sinking food into the tank after dark. Most foods are accepted gluttonously. Individuals will gorge themselves on food to the point of appearing fit to burst. Furniture Does not harm plants and all that is really required is a dark place in which the catfish can find refuge. Care must be taken that this is no where near the heater element as these fish will wedge themselves between the heater and the aquarium wall and may burn themselves. Compatibility A perfect community tank resident. Suggested Tankmates As all doradids, does well with its conspecifics and other members of the same family. Can be kept with anything from tetras to medium sized cichlids. Breeding Has not been documented in the aquarium but reports do exist of reproduction in the wild which involves a bubble nest built in plants which the male guards. The author has collected very small ( < 10 mm SL) young Amblydoras in semi-aquatic reeds and partially submerged shrubs. No adults were collected in water about 45 cm deep. Youngsters were everywhere and one swipe of the net could turn up 10 or more young. There are 29 registered keepers, view all "my cats" data. There are 11 records of this fish being seen, view them all.